A multitude appears. Slowly they are all coming, sort of together, facing a strong source of light, not sure about what they are doing there or what they are capable of doing facing such a strange situation. They stop, shading their eyes against the light with their hands, talking to each other and trying to figure out what is going on, looking further but hesitating to step forward. They stare for a while, observe, and slowly get dispersed. This description refers to a long single shot, 15 minutes long to be projected onto a large surface of around 20 x 3,5m. 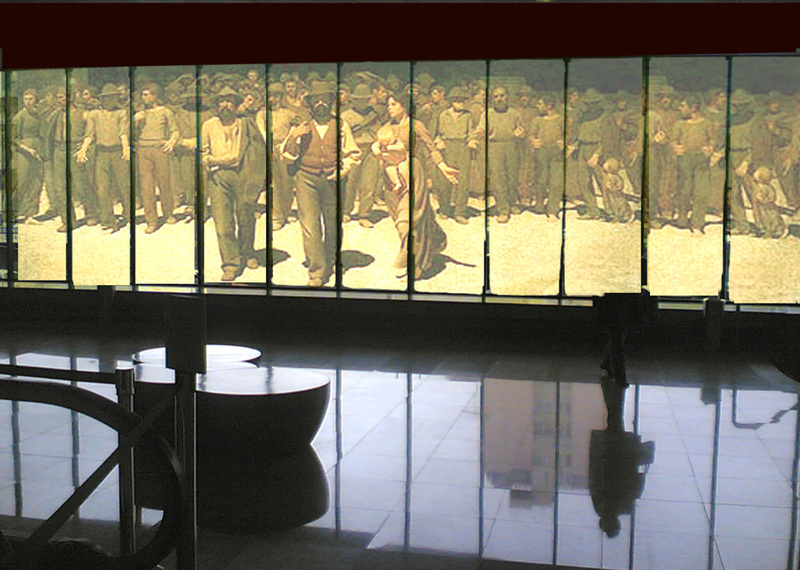 Ideally the projection should occurs over a facade or through large windows on the street level, using 3 projectors – as in a triple extended screen mode. 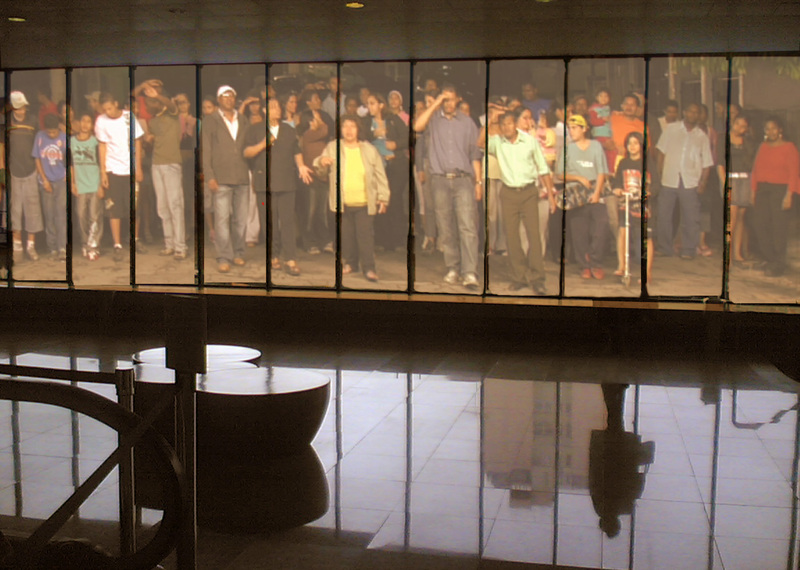 The project alludes to both the possibility and impossibility of those people (that multitude, a community?) to inhabit that space. The large scale, the social and cultural profile of the group, their movement before the camera should hint at the fact that they exist there, rather than merely be projected (or be part of a third party’s project). The images were initially captured in the surroundings of SESC Pinheiros – São Paulo (the commissioning venue for the first edition of this project), a low middle class neighbourhood. The single shot counted on the participation of more than 100 indigenous people living in urban areas in São Paulo. It points to the idea of community as it is perceived nowadays: a group of interacting people sharing or living in a common location – more likely to share the fear than the happiness. We can also say that people in communities share a temporary condition or experience, which may lead or not to an unified action. That is exactly what the Multitude sequence points out: following a supposedly extraordinary incident people tend to look for each other’s complicity, but also tend to get dispersed easily. Not exactly a negative view, the sequence allows for varied interpretations of the group “depicted”: the area’s service providers (maids, construction workers, etc. ), the unlikely profile of a multitude as thought of by Hardt and Negri; the conflict between high and low culture; the individual versus the collective; the individual’s condition as interactor in the field of art and technology. An ideal condition in which to ‘re-present’ this project would be to record a second footage, focusing a new situation in the hosting venue, that would somehow – taking into consideration the specificities of the city – recall a scenario of social/cultural/communal/representational abyss as briefly described above. As such, the project would maintain an aspect of site-specificity that framed its first edition in São Paulo.